So you're ready to start memorizing Scripture? Great! Let's start by memorizing Romans 5:8! First, read the verse aloud. Then, click "hide more" (above) and try saying it again. Click on any blurred words for a hint. You can also click the play button to listen to the verse. If you enjoy memorizing this way, try VerseLocker. It's our free online tool that helps you memorize any verse from the Bible using tools like this one. 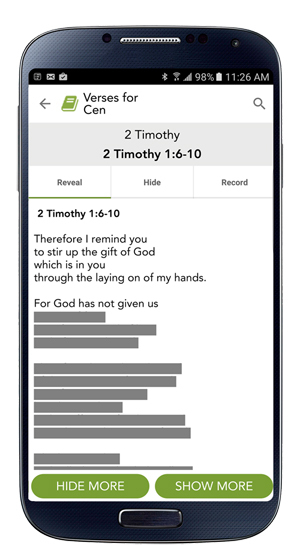 If you're interested in memorizing a pre-selected collection of verses with commentary and study questions, consider using the SMF App. Read your memory verse in context thoughtfully and slowly. Read it aloud 5 times emphasizing different words each time. Write out the memory verse with a new line for each phrase. Then, erase one line at a time and fill in the blanks from memory. Recite the whole verse 7 times. Repeat daily, reviewing old verses before learning new ones. Recite your verses to someone else at a set time each week.